I’m always planning my travels and asking, I wonder how far it is from ___ to ___? Or, if we want to drive about 200 miles today, where does that get us? Google Maps is my tool of choice for anything map related and it can answer both of these questions. To go from X to Y, is how many miles? 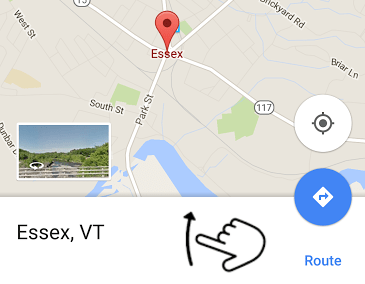 To ask that question, I use the directions feature of Google Maps. Tap the directions button to get started. On a computer, you’ll see that button at the top left of your screen next to the search box. On a smartphone, you’ll see it in a blue circle at the bottom right. On either one, clicking it will open up a From and To field. On your phone it assumes you want the “From” location to be your current location, but you can just tap on that and type somewhere else. On a computer, you can click the map to set a From or To location. 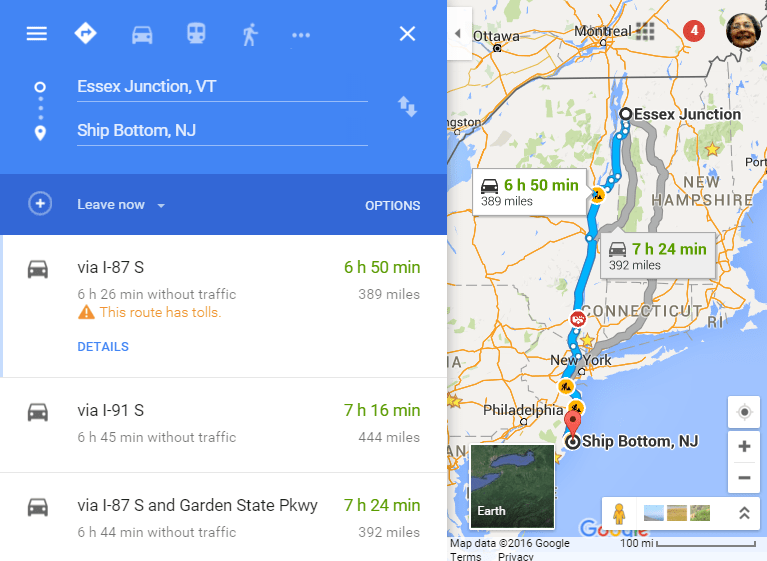 So, if I want to know how many miles it is from Essex Junction, VT to Ship Bottom, NJ, it will look like the screenshots below. 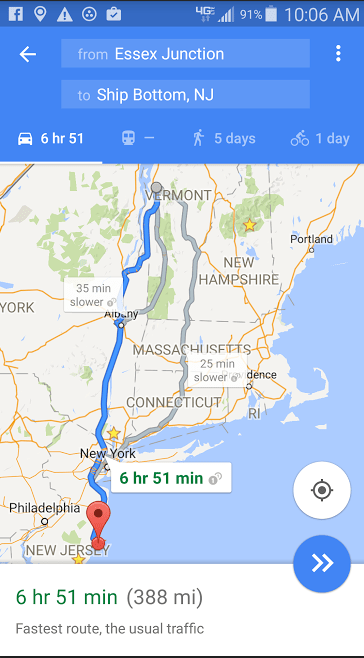 Google reports that it is at least 388 miles. Note: if we were using this to navigate, I would use exact addresses or locations, but just to get a ballpark I use city names. If I go X miles, where am I? 388 miles is way too far for us to go in one day in our motorhome! We prefer more like 200 miles. We’ve been doing this a long time, and we’re lazy! The question I want to ask now is, “If we leave from Essex Junction and go 200 miles in the general direction of Ship Bottom, where are we? Google calls that “measure distance” and it does it with a straight line, so this won’t be accurate with turn by turn, it will be ‘as the crow flies.’ I wish I could ask, “following the route above, show me 200 miles from the start.” The only program I’ve ever found that can do that is Streets & Trips from Microsoft, and it has been discontinued. So I will make due with Google’s approximation. On a Computer: Right click on your starting point and choose the option to Measure Distance. Now you can click another point and see the distance written next to the line that is drawn and also in the Measure distance dialog box that appears at the bottom of the screen. You can drag that one point until you see 200 miles, or you can click to set multiple points and get a closer approximation to actual distance. Tap on “mesure distance” and you will now see a black circle. You can’t drag the circle, you drag the map and the circle stays in the center. You can pinch and zoom the map and the bottom of the screen will report the miles represented. You gotta play with it a bit to get the hang of it. Once you got it, it’s easy. 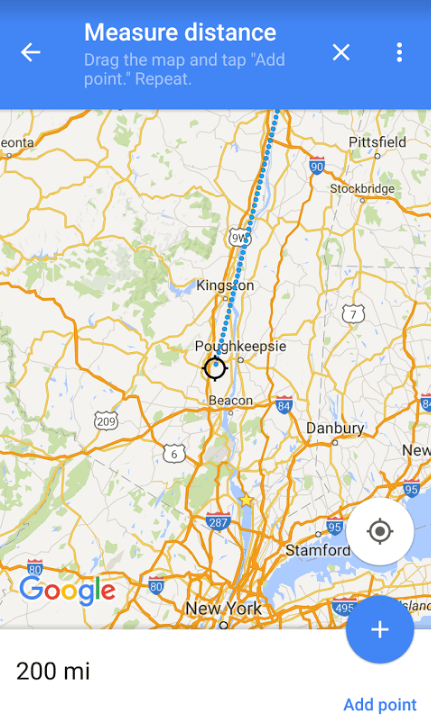 Both the computer and the phone report that a 200 mile straight line from Essex, lands us somewhere between Kingston and Beacon, NY. Knowing that the true distance will be longer than the straight line, I’ll start looking for campgrounds in the vicinity of Kingston. Here’s a video that demonstrates both types of measurements for Members only. This article is by Chris Guld, of GeeksOnTour.com. To learn more about using Google Maps and many other programs of use to travelers, visit her website and consider becoming a member in order to view all the tutorial videos. Published by MrsGeek, in Blog. Tagged with #GeeksWhoTeach, Android, Apps for Travelers, Droid, Google Maps, iPad, iPhone, Smartphones.